IPM is pivotal in providing effective and sustainable management of pests and diseases in various crops. University of California has an extensive IPM program with sound science-based solutions for numerous pests, diseases, and weeds. One of our approaches is to provide guidelines for year-round IPM to help mitigate environmental health issues while providing practical management options. Year-round IPM program enables the growers to make appropriate decisions before and throughout the growing season to avoid or mitigate pest problems. From choosing the right field or ideal cultivar to timely harvesting of fruit or postharvest field sanitation are important in avoiding several problems. Here is a brief overview of year-round strawberry IPM. Crop rotation: It eliminates the availability of host plants for pests or diseases. Rotating strawberries with nonsusceptible hosts minimizes the risk of diseases such as angular leaf spot, anthracnose, charcoal rot, Fusarium wilt, and Verticillium wilt. Field selection: A clean, well-drained field free of diseases or away from sources of pest infestations will reduce the risk of some diseases like Fusarium wilt and pests like lygus bug and spider mites. 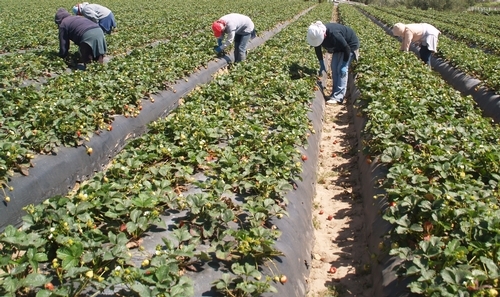 Fields close to second-year strawberries or can have early infestations of certain pests. Fumigation or solarization: Several soilborne diseases and weeds can be effectively controlled through fumigation or solarization (where practical). Studies with non-chemical fumigation techniques such as anaerobic soil disinfestation are under way and can provide alternative solutions to chemical fumigants. Cultivar selection: Choose a cultivar that is resistant to major pests and/or diseases. Weed management: Several flowering weeds serve as a source of lygus bugs. Managing such weeds in winter reduces the risk of lygus bug. Plastic mulch: Using a mulch that promotes healthy plant growth helps plants withstand some disease and pest issues. Clean and strong transplants: Angular leaf spot, anthracnose, common leaf spot, phytophthora crown rot, powdery mildew, and pallidosis-related decline of strawberry are among the diseases that can be introduced to the production fields through infected transplants. Pests like spider mites and cyclamen mites can also be brought in through transplants. Inadequate or excessive chilling of transplants can result in reduced yields and predispose plants to pest or disease problems. Obtaining transplants from a reputable nursery is always a good investment. Planting: Adequate spacing and other care while planting are important for optimal plant growth and yield as well as reducing the risk of certain diseases. 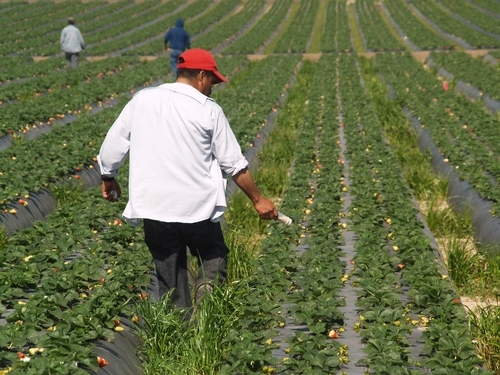 Irrigation: Since strawberries are sensitive to salinity, good water source is important for plant health. Excessive drip or overhead irrigation causes several disease problems such as angular leaf spot, common leaf spot, and red stele. Water stress can weaken plants and worsen the spider mite problem. Nutrition: Optimal fertilizer supply is important for a healthy crop and good yields. Excessive nitrogen application can worsen some pest problems or diseases like powdery mildew and Verticillium wilt. Sanitation: Removal of infected or old fruit or plant material is important for minimizing botrytis fruit rot, leather rot, mucor rot, and Rhizopus fruit rot. This practice also important in managing spotted-wing drosophila or other such pests. Regular monitoring: Regularly monitoring fields for pest, disease or other problems and taking preventive or proactive measures is critical. Proper sampling techniques are important for making treatment decisions. Pesticides: Timely application of right pesticides is critical in preventing and minimizing the problems. Rotating chemicals with different modes of action increases the control efficacy and reduces the risk of resistance. If insecticide resistance is suspected, test over a small area or on suspected populations before large scale application. Biological control: Conserve natural enemies by providing alternate hosts as refuges and by using softer chemicals. Good natural enemy populations play a major role in managing pest populations. Predatory mites are effective in controlling spider mites, but choosing the right species at the right time is important. Microbial control: In recent field studies, the entomopathogenic fungus, Beauveria bassiana showed a potential for managing aphids, lygus bug, and spider mites. Botanical pesticides: Recent field trials produced promising results with azadirachtin, a neem-based insect growth regulator in managing some pests including lygus bug. Other measures and all-time care with good agricultural practices are important for a successful IPM. IPM is an ecosystem-based strategy for a long-term prevention of pests or their damage through a combination of various techniques. Pesticides are used only as necessary with appropriate materials that have minimal risk to humans, non-target organisms, and the environment. 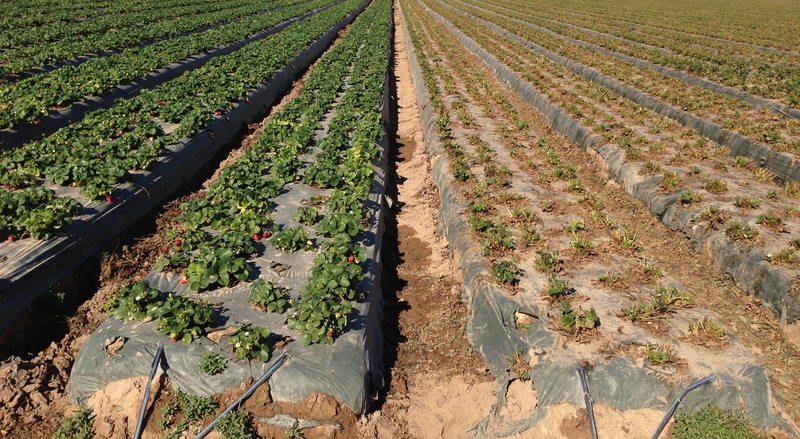 Additional details on various pests, diseases, and weeds, sampling procedures, survey forms, management options, and year-round strawberry IPM program can be found at the following UC resources:http://www.ipm.ucdavis.edu/PMG/C734/m734yi01.html and http://www.ipm.ucdavis.edu/PMG/selectnewpest.strawberry.html.